I’m already starting to worry about how many “summer grilling” days we are gonna have left! It’s a sad day when the grill doesn’t get used almost every day so I’m still trying to take full advantage of it while I can! These kabobs were well worth making on one of my last grilling days. They definitely did not lack in flavor; that is FOR sure! I loved the use of spices found here. The chili powder/paprika went fabulously with the garlic and lime and there was even a slight bit of heat from the cayenne. These kabobs tasted like a Mexican BBQ and they were great on their own, but as I ate them I thought they would be SO good in tacos or fajitas too. Either way . . . they are delicious and in no way boring! Make them quick – before grilling season is O.V.E.R. Cut chicken and pepper into 2 inch pieces. Peel onion and cut into quarters. Slice through each quarter to make 8 chunks. (When you pull apart the onion layers, the outer layers should now be in roughly 2 inch pieces) Set aside. Preheat the grill to medium heat. 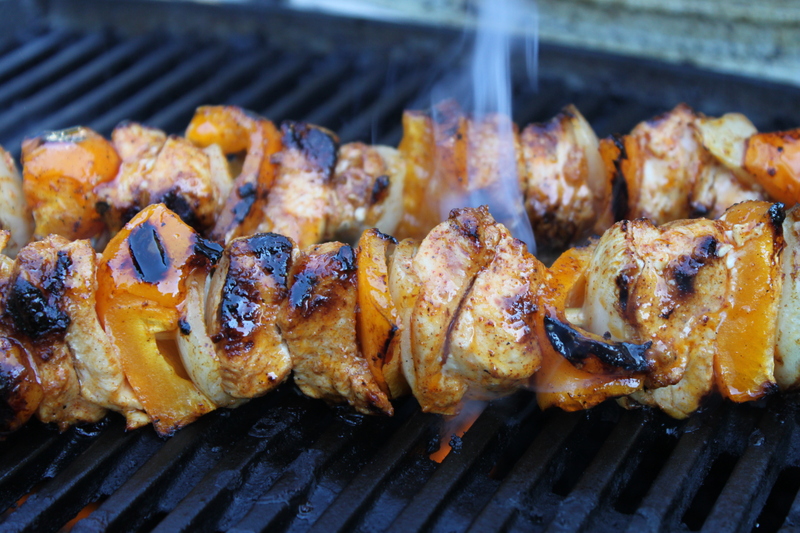 Thread chicken, pepper, and onion onto metal skewers and discard the marinade. Grill skewers, turning occasionally, for 10-15 minutes, or until juices run clear (or chicken registers 165 degrees when tested with a termometer). If you reserved any marinade, brush marinade on skewers each time you turn them. I need to do this sometime this week when the weather is good. These looks excellent.